When a military veteran decides to hang up his or her uniform, there is often a void – a huge void, actually – in their lives. Making the move from military to civilian is a crucial time in the vet’s life. Fortunately, Michigan State University employees who are veterans have a number of places to turn for help in making that transition. A good place to start is the WorkLife Office (WLO), where Jaimie Hutchison, lifespan and family services coordinator, can offer some much-needed guidance. Although not a veteran herself, she is married to an Air Force veteran, has lived on military bases and intimately knows the ways of military life. The WLO’s goal is to help people make their work lives and personal lives a better fit. This can be especially challenging for veterans, who, in many cases, are adjusting to an entirely new life. “I work with people considering or making career transitions and [and advise them on] how they can apply their military skill set to another kind of work,” she said. Another great source of information for the employee veteran is the MSU Veteran Outreach Group. Composed of a mix of veterans, veteran family members and those interested in assisting veterans, the group connects veterans on campus, provides information, sponsors events and helps build a sense of community. Hutchison comes by her military-life knowledge honestly. 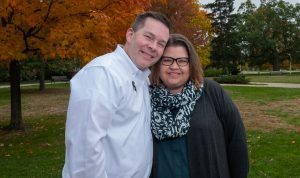 She is married to Wayne Hutchison, a former MSU ROTC student and an 11-year veteran of the Air Force, who now serves MSU as director of academic and program services for the Broad College of Business’s Full-Time MBA program. Wayne Hutchison lived and, in some ways, continues to live that military-to-civilian transition, and is uniquely qualified to help others in that situation. He said he sees many parallels between life in the military and life in higher education. “The transition for any service member can be challenging,” he said. “Finding your post-military fit can be a process. Like the military, this is a large organization that definitely has an institutional culture, which makes it a great place for a transitioning military officer. In addition to his day job, Wayne Hutchison is also a student, working to finish a Ph.D. in the College of Education’s Higher Adult and Lifelong Education program. His work is funded mostly through the GI Bill and focuses on how military service can affect how student veterans experience college. For information on other veterans-related events and programs at MSU, visit https://www.hr.msu.edu/veterans/veterans-at-msu.html. Currently, there are as many as 400 self-identified veterans working at MSU. The estimate is that there are at least twice as many people on campus who serve or served in the military or who are immediate family members of veterans.